﻿ France 2-1 Portugal. No glory in Paris! 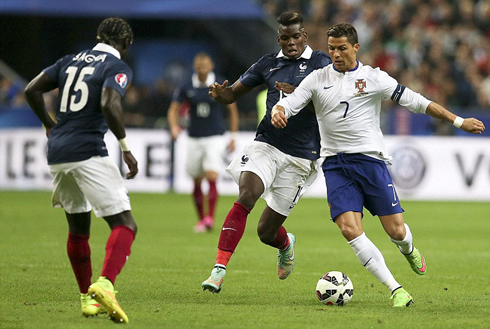 11.10.2014 » France 2-1 Portugal. No glory in Paris! There wasn't much at stake this Saturday night in Paris, but France and Portugal still clashed in the Stade de France hoping to boost their motivation levels with a win. The hosts were the ones who ended up prevailing with a 2-1 victory though and Portugal will now have to focus on bouncing back from another loss right in their next game, next Tuesday against Denmark. 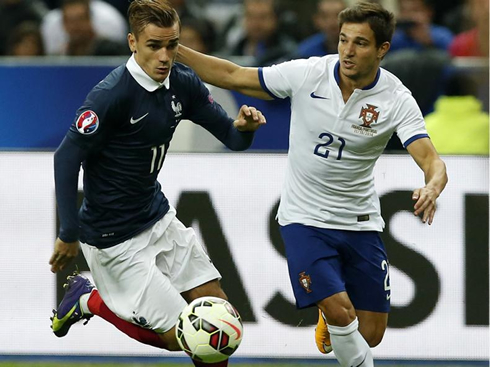 Tradition still stands and Portugal has once again been defeated in a match against France. The two nations locked horns this Saturday night in the Stade de France in Paris, in a friendly international where naturally there wasn't much to play for. Nevertheless and playing at home, France managed to mark their superiority and have beaten Portugal and its new coach Fernando Santos, by 2-1. 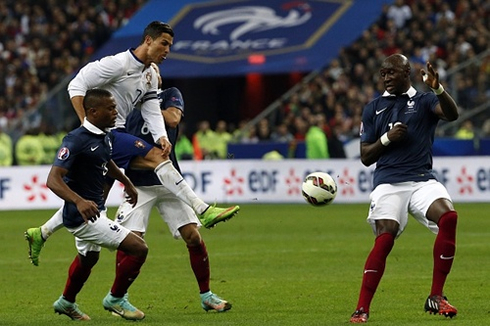 The hosts' goals were delivered by Real Madrid's forward Karim Benzema and Juventus midfielder Paul Pogba, while Portugal's goal of honor was struck by Ricardo Quaresma. Cristiano Ronaldo was on the pitch for roughly 75 minutes, but unlike what usually happens in his games for the Merengues, he never got to be as influential as he's used to. Next Tuesday, Portugal will visit Denmark in Copenhagen, for the team's second fixture of their EURO 2016 qualifiers campaign. Portugal announced Fernando Santos as their new National Team coach on September 23, certainly hoping that by ditching Paulo Bento and having a new voice of command in charge of the squad, things would immediately start going their way. That's not what happened last night though and with a decisive game scheduled for next Tuesday against Denmark, the Portuguese National Team is already in a situation where there's almost no margin at all for further errors. Fernando Santos brought 6 changes to the Portuguese starting lineup since their last match against Albania on September 7 (when they were still being coached by Paulo Bento), with Rui Patrício remaining in goal and a back-four formed by Cédric on the right, Pepe and Bruno Alves in the center, and Eliseu on the left. In midfield, Atletico Madrid's Tiago made his return to the team, teaming up with João Moutinho and one of La Liga's revelations this season, Valencia's André Gomes. The attacking missions were carried through by 3 men, those being Danny, Nani and obviously Cristiano Ronaldo. The match basically started with France coming forward in full strength. With that in mind, it wasn't that surprising to note that it only took them 3 minutes to strike the first blow and it would be Real Madrid's striker Karim Benzema finishing the play. It started with a good initiative from Atletico Madrid's new signing, Antoine Griezmann, who breached into Portugal's defense with ease and then sent a cross to the opposite side of the box destined to Sagna, allowing the French defender to hit the target with a strong right-foot shot. Rui Patrício managed to block it on the ground on a first instance, but as no one really cleared the rebound away from danger, Karim Benzema found himself with a great opportunity to score his 25th goal for France from an easy tap-in. During those first 15 to 20 minutes of the game, Portugal was struggling quite a bit to position properly on the pitch and France seemed thirsty for more blood. Things only started becoming more levelled roughly at the mid-point of the first half, but even when that happened, the visitors never got to create enough dangerous plays as they certainly intended. The Portuguese coach decided to do a couple changes at half-time, bringing in William Carvalho for André Gomes and Ricardo Carvalho for Bruno Alves. It may have not been a direct consequence of those two substitutions, but the truth is that Portugal came in for the second-half dominating more and finally creating the chances that they had been lacking so far. However and clearly against the tide of the game, it would be France getting a second and not Portugal reaching the equalizer. The former Manchester United left-back, Patrice Evra, found a way to exploit Portugal's weaknesses following a free-throw near the box and escaped his marking in order to deliver a dangerous pass to Karim Benzema. The Real Madrid forward had all the time in the world to control the ball and then assist Paul Pogba, who was coming from behind to support the attack. The 21-year old showed great composure and finished it off with a clean right-foot strike, extending the lead into a 2-goal difference. 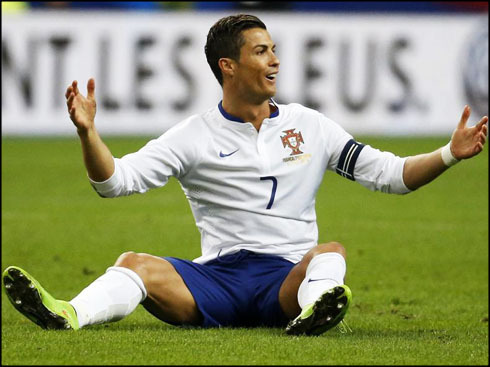 Portugal only managed to get someone in the scoresheet in the 77th minute of the game, and at a time when Cristiano Ronaldo had already stepped out to give his place to José Mario. It was precisely that teammate of his who got to draw the penalty-kick that allowed Ricardo Quaresma to cut distances and still give a gleam of hope for Fernando Santos' men in the remaining 15 minutes of the game. No further changes in the scoreline took place though and Portugal had to settle with another loss at the hands of their "bête noir", the French National Team. 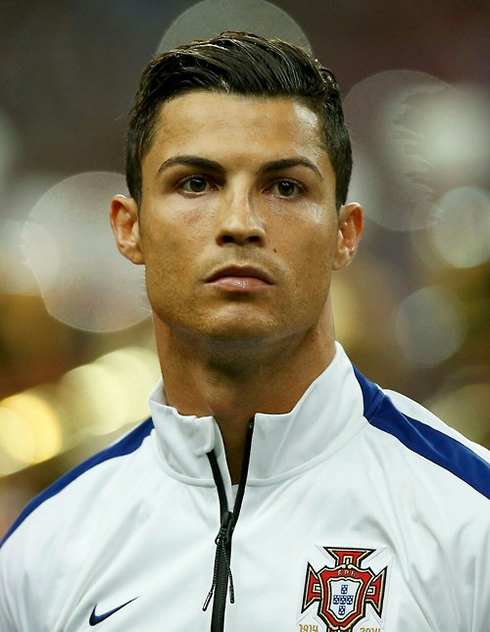 Cristiano Ronaldo next game for Portugal is a EURO 2016 qualifier against Denmark, on October 14 (Tuesday). You can watch Juventus live stream, Denmark vs Portugal, Luxembourg vs Spain, Estonia vs England, Iceland vs Netherlands, and Germany vs Ireland, all matches provided from our soccer live streaming section.